“Formula” fields bring the power of Excel formulas directly into Woodpecker. By utilizing “Formula” fields, you can perform mathematical operations on other Woodpecker fields and automatically calculate the dynamic data that your document needs. When creating a formula field, the formula may contain static values, references to other fields, or both. Almost anything you can do in Excel, you can with with a Woodpecker field. You can specify the format for the result of a formula field if the result is a date or a number. 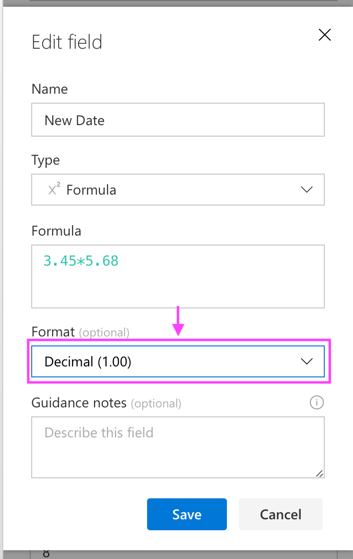 The “format” dropdown within the formula field will allow you to select from several date formatting options as well as integer and decimal formatting options. #DIV/0! Divide by zero error. #NAME? Unrecognized function name or variable name. #N/A Indicates that a value is not available to a formula. #NUM! Occurs when formula encounters an invalid number. #VALUE! Occurs when one of formula arguments is of the wrong type. For a detailed reference of all supported operators and functions, please see the formula field reference.